I followed all instructions but why AnyTrans still won't allow me to transfer my App data and game saves among my iPhone, iPad and iPod touch? Take a tour of this awarded software so that you can make use of it to transfer app & game data among your iPhone, iPad and iPod touch. Download it to have a try. Recently we received some feedbacks from our customer reporting that our AnyTrans failed to transfer their App data and game saves between multiple iOS devices. The affected Apps include Bakery Story, Clash of Clans, Breitling Reno Air Race, Smurfs' Village, Snoopy's Street Fair. Even though our AnyTrans has passed through stress testing (tested with more than 80 thousands Apps) before publishing, we still cannot guarantee it works for all Apps ever made. If you also met a similar issue, please refer to this tutorial to find a solution. After a tremendous volume of testing and researching, we found that most of Apps not supported by our software are associated with Apple Game Center. Take Snoopy's Street Fair as an example. "Supposed you started the game on iPhone, and you want to continue the game on iPad." Step 1: Transfer the App from iPhone to iPad with AnyTrans. 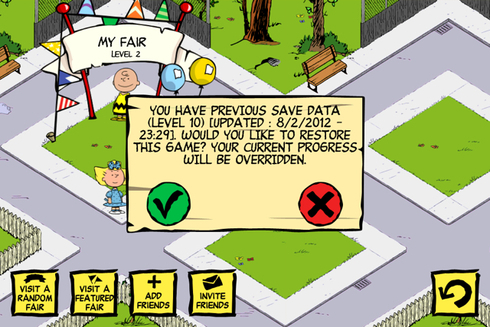 Step 2: If you have never played Snoopy's Street Fair on your iPhone before, you need to play through the tutorial level 1 - 2 (other App games may require more levels for tutoring). Step 3: Turn on your internet connection, and tap on FRIENDS button, and then choose "VISIT YOUR FRIEND'S FAIRS" > login into your Facebook or Game Center account you use on your iPhone > then the server will ask you whether you would like to restore a previous saved game, choose the Green button and then you will get your fair on your iPad. As there are thousands of Apps have been newly added to iTunes Store per day, we hardly test them one by one. So it would be greatly appreciated if you can give us some feedback by leaving a comment. And if you still have questions, please feel free to contact our support team.